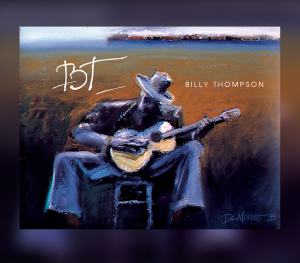 I just had the opportunity to review the most recent release, BT, from Billy Thompson and it's terrific! Opening with Burn It Down, Bernadette, Billy is smoking right out of the can with an extremely funky rocker. leading the way on vocal and slide guitar, backed by Michael Leroy Peed on keys, Daryl Johnson on bass, Eric Selby on drums, DK Kelly on percussion and Xzantiny Grant on vocals, these guys are hot. On blues shuffle, Phoine, Billy is backed by a stacked deck with Mike Finnigan, James Hutchinson on bass and Anthony Braunagel on drums. Finnigan really winds out the keys giving Billy plenty of air to pound with screaming riffs. Very nice. Cool R&B number, Silent Warrior has a great feel with excellent guitar riffs pushing the intensity during the beef of the track. Thompson's vocals are soulful and spot on. Very nice. With it's slick R&B tempo, Mud Island Woman is infectious and with Thompson's stinging harp riffs, crisp guitar lead and vocal lead, this may be the best track on the release. Bluesy, Stranger really showcases Thompson's soulful vocals and solid vocal phrasing. Finnigan's organ work nicely surrounds Thompson's shimmering guitar riffs, nicely accenting the suspense of the track. This track is really hot giving Thompson a great opportunity to not only showcase his vocals but to stretch on guitar. Excellent! In The Back Of Garage is a definite radio style track with an excellent melody with a soulful sound, and precise guitar work. Children Of The Sun is a smooth ballad with biting guitars riffs and rich piano faire developing into a progressive jazz tune based on a Whipping Post like rhythm. Very nice. Wrapping the release is cool, stylistic blues number, Reason For Goin' Fishin', with it's rural feel. Peed's bouncy piano work and Selby's stumble drums give the track a nice Lusiana country feel. This is a real nice closer for a real strong release.